You write a blog post that’s taken hours to create and when you’re finally happy with it, you hit publish. You hope for a spike in your blog traffic, so you check your statistics, but it’s only a handful of page views. You tell yourself to give it a couple of hours, so that people can come reeling in. You distract yourself with other things or maybe take a nap. You don’t want to obsess over numbers, but when you have spare time you check back on your page views. And it’s still not where you’d hoped it would be. The days roll on by and when you check again, your post is stuck at less than ten views. You know you put your heart into that post. You’ve been posting consistently and yet your page views are stagnant. You feel like you’re talking to an endless void. Your hope of making money from content creation seem bleak. How are you supposed to earn money if you aren’t getting any page views? I can relate. I’ve had multiple blogs, and some of those blogs would get less than ten views a day. It didn’t feel great. 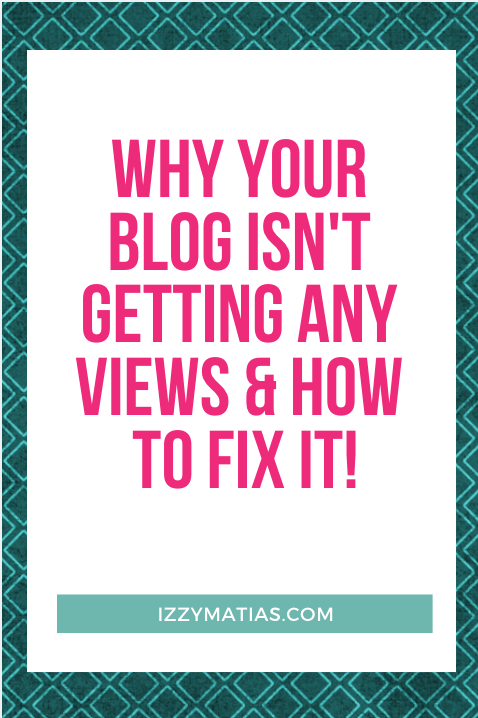 Let me share with you a couple of reasons why you’re stuck at less than ten page views and what you can do to improve. Nobody’s going to care about your content if it doesn’t resonate with something they’re struggling with. This goes back to a business concept: find a problem and present a solution. Take this post for example. My blog is aimed at bloggers, content creators, and influencers; and as a fellow blogger, I know the frustration that comes with having little to no readers. You’ve got to create content that attracts your target readers. How exactly can you do that? First, you have to define who your community is. If you’re a fashion blogger, get specific. What sub-topic about fashion do you post about? Is it about looking like a mega boss through thrift finds? When you identify your focus, you then define the topics that are of interest to your ideal community. From the example, you could make a post about the different ways to style a vintage suit jacket for work. If this is something you’re struggling with, take a step back and do a blog audit. Are the posts you create the type of content your community would like to see? Or are they posts about varying topics that have no interest to them? “A what link?” you might be asking. Get creative! Why not link previous content by using a photo or video? If you’ve created graphics in the past, you can re-use them here to capture the attention of your reader. Head on over to Canva and create eye-catching graphics you can use inside your post. The fastest and simplest way to do this is to install a plug-in. It automatically shows your related posts at the end of a current post. Once you have content that attracts your target community, you’ll want to keep them on your site as long as you can. Google Analytics can track how long someone stays in your site using the bounce rate metric. What you have to remember here is that the lower the bounce rate, the longer a person stays (or reads) your site. Bounce rates matter because this tells Google that you’ve provided the person with valuable information and that you’re site isn’t spammy. What this does is to promote your other content and make someone stay longer on your website. You hook them with other posts that they’d be likely interested in reading based on your current post. How long do you spend creating your post versus promoting it? One of my mistakes in my previous blogs was that I’d spend more time creating the post rather than promoting it. You should spend just as much time promoting your work. Track how long it takes you to create a post until you hit publish. Now, spend that exact amount of time (if not more) promoting your content. This is probably your go-to and what you do most of the time. And that’s okay! But know that you can only reach so much using this method. I suggest automating this step and if possible, promote your content on loop. Find relevant blogging groups and find out which days they allow self-promotion. Some groups have daily threads for promoting your material on different social media platforms. However, you have to do your research before you join a group as every group has rules. For example, there are groups that require you to share or comment on all of the links in that thread. Personally, I find that exhausting. I want to select the posts that I share because I want to make sure they’re relevant to my community and not just because I’m required to share it. Another way to promote your blog is to run Facebook or Instagram ads; however, do your research before investing in this. Study how effective Facebook advertisements work, so that you really get what you pay for. Promote your posts through social media scheduling tools. I schedule my posts in advance and recently have looked into tools that can post to Twitter on loop. Ever since I started my Tailwind subscription, their Smart Loop feature has been such a time-saving tool that it got me wondering if there were other platforms that would allow me to automate my posts on loop. More than a black hole of pretty photos and inspiration, Pinterest is a visual search engine. Think: Google, but your search results come out in photos instead of text. I had heard about how powerful Pinterest was for more than a year, but I only started taking it seriously last November. I wish I started sooner because maybe by now I’d have a bigger reach. My Pinterest referral traffic isn’t in the hundreds or thousands yet, but I can say that I get blog traffic from Pinterest. And ultimately, some of them sign-up for my opt-in freebie. The only way forward to help others as well. Your journey can feel lonely especially if you don’t connect with fellow content creators. You can reach out to fellow creators when you tweet or send them a DM on Instagram. Of course, always go with your instincts when reaching out to people online. You could also reach out to them when you mention them in your post or recommend their products/services. Last year, I’d written a post inspired by another blogger’s post. Though I didn’t reach out, she had found my post and shared it across her social media channels. It’s all about supporting each other and helping each other grow. Have an abundant mindset. Someone else’s success doesn’t limit yours. There is enough energy and space for your success too! The only way you’ll know what type of content your community likes is through studying your analytics. If you haven’t, sign-up for Google Analytics, where you’ll learn data about like which specific posts performed well, which convert first time readers into subscribers, or even how long someone stays in your site. By doing your research, you can see what content you should post more of. Don’t forget to experiment with different type of posts to really get a better understanding of what works for you and what doesn’t. Thanks for the tips! I am working on growing my own blog and hopefully these tips will come in handy! Lots of helpful tips! Now that I’ve been blogging for almost a year, I’ve been learning more and more as I go along, but I definitely still have more to learn. Facebook share threads and Pinterest have both been instrumental in helping me to gets lots of traffic. Out of curiosity, what’s the plugin you use to show “related posts” at the bottom of a current post? This is all great info and definitely gives me something to think about before I hit publish! Lots of good tips for me to put into practice! Thanks a lot for this post 🙂 I use Canva a lot and I love it. It’s a great way to make images also to promote your posts on social media. It always works well with Pinterest and Instagram for me (although I’m still a tiny blog). Really great tips! Knowing exactly who you’re writing for is crucial. A game-changer. These are all such great reminders. I took a break from promoting last month and my numbers dipped horribly. The last week of the month I jumped back in and noticed a huge increase. It really takes time and effort. i needed this. while i have had more page views than before, it is still not what i expected it would be.. so i need to get to that magical point where that number justifies the effort. Good luck! Hope these tips help! These are great tips. I definitely need to up my connecting game with other creators. Thanks! Tailwind and Yoast have been such a game-changer for me! My goal this year though is to work on my internal linking. These are SUCH great tips! I need to reread these a couple times, because I made too many mental notes. I didn’t know related content could be a plug-in! I always thought that looked great on other blogs but didn’t think my blog host site provided it. I’ll definitely be making that change, thank you!